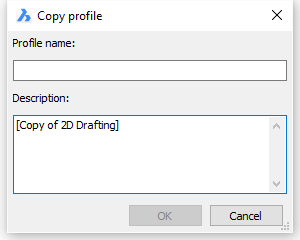 Sets the current user profile; also creates, copies, deletes, imports, and exports profiles through a dialog box. Select a profile in the list, then click the Set Current button to set a profile current. 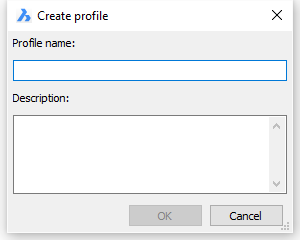 The next time you start up the program, it uses this profile. The current profile is marked in the list with a check mark. Exporting, then importing, a profile allows you to migrate user preferences from one computer to another. Select the profile, and then click the Start button. If the SingletonMode user preference is set to Yes it is not possible to have multiple BricsCAD sessions open simultaneously. Closes the User Profile Manager dialog box. 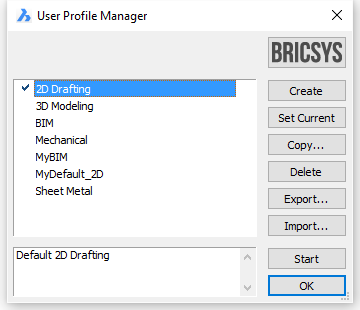 Customize - customizes the user interface of BricsCAD: menus, toolbars, keyboard shortcuts, aliases, and shell commands.